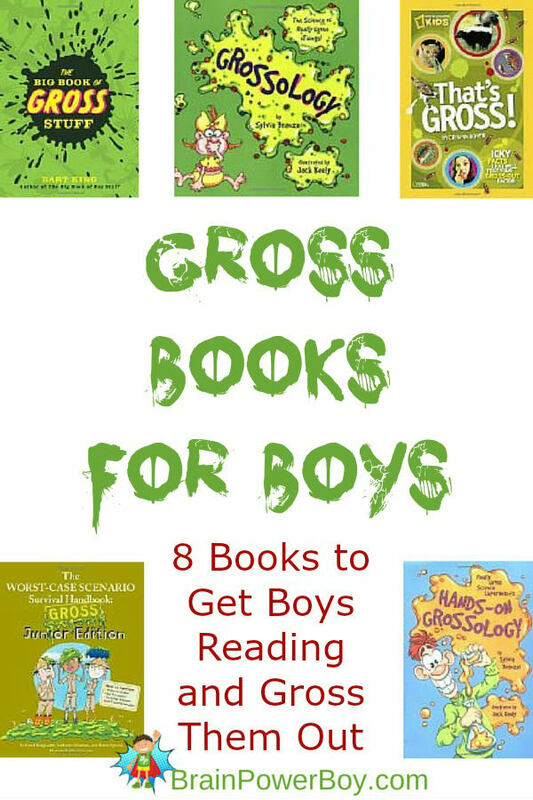 Best Books for Boys: Gross Books! Does your boy like gross things? Does he like to think about and talk about icky, sloppy, sticky, goopy, and stinky? Then this gross books list is for you. I am not a big fan of gross. I actually have my husband take care of things that venture into the area of gross-ness. However, I know a LOT of boys who really get a kick out of all things gross and disgusting. This list is for them. Believe me when I say this was a bit of a sacrifice on my part because in order to bring you our best books for boys lists I actually look at the books and find the best ones. Finding the best gross books exposed me to many things that I would rather not know and quite a few that I could have gone my whole life without seeing a picture of! Believe me when I say these books have totally gross stuff in them. As I said, these books are gross. Do keep in mind that there are, of course, different levels of gross. Make sure you take a look to see if the books are appropriate for your family before handing them off. I didn’t add the ones that were really bad. We will start off with one for younger boys. Gross but not over the top – Worst-Case Scenario Survival Handbook Gross Junior Edition It begins with the human body (boogers, barf, spit, gas, burps) and moves on to the house, school and also a bit on animals. This book has drawn images. Includes a few activities at the back – interested in making fake poop? They have you covered! There are some interesting facts in Grossology . It is broken up by type of grossness and there are three sections: slimy, mushy oozy gross things; stinky, smelly gross things; and crusty, scaly gross things. I am not a fan of the illustrations but that doesn’t mean your boy won’t like them. Each topic has quite a bit of info. Grossology and You is by the same author/illustration team as the book above but is all about the body. See also: Animal Grossology: The Science of Creatures Gross and Disgusting for an animal version if your boy really likes these books or enjoys gross animal stuff. A companion to the Grossology books above that also stands on its own is Hands-On Grossology . This is a book of really gross science experiments. Make fake blisters and wounds, make animal poop and fake blood, pee and spit experiments and more. It is pretty interesting, although admittedly, still gross. That’s Gross! : Icky Facts That Will Test Your Gross-Out Factor put out by National Geographic Kids is full of color pictures. That may, or may not, be a good thing lol. I like this book (well, you know what I mean) because it is very appealing both visually and with its text style. They lay out the facts in a compelling way. There is a good amount of reading in here but it doesn’t seem like a lot as it is in small bites. Recommended. Let’s just say that a book that has a boy sticking his finger up his nose is going to get a lot of boys’ attention. The book is Oh, Yuck! The Encyclopedia of Everything Nasty . It has the encyclopedic style of categorizing things from A-Z. As an example, F is for farts, feces, fleas, foul feet, fungi and more. There are things like mummies and cannibals in here but they do give the facts on these and other subjects, as well as some interesting tidbits. This book takes it up a notch. It is for older readers. They say 8+, I am thinking 10+ but it certainly depends on the boy. There are jokes (some questionable), and in general this is pretty funny. I think the author does a good job of really “getting” what boys would like. Regarding The Big Book of Gross Stuff — those with weak stomachs may wish to steer clear. Ok, so if you made it this far you know these books are full of gross stuff. Really gross stuff! However, do keep in mind that they are also a treasure trove of learning. Honestly there are hands-on activities to do, historical references, lots of science, new vocabulary and plenty of other great learning ops that boys will get just from handing them books these books that they will likely really enjoy. Thanks Marie – yup, sometimes boys seem to really like this stuff. The great thing is that there are a lot of very interesting things to learn about all that is gross! What a great list! My son (and my daughter) are into all things gross and messy. Thanks Sarah – I hope they enjoy a few of these books! What a fantastic list. My youngest would love these titles, and I have a funny feeling he will enjoy then for a few years, I might order a couple as a summer break surprise. These gross books certainly would make a good surprise. Glad you liked the list. What a fun list, thanks for sharing! I came here via Mommy Crusader and Her Knights Saturday Night Link Up. I’m sure there are many girls that would like the books as well. Our site’s focus is boys so that is how we roll. Glad you liked the post and I agree that there are just the right type of book to get kids reading.